Registration allows to use discount! A classic combination of red roses Prestige and white chrysanthemums. A round, dense bouquet in a spiral technique is assembled from fresh flowers and packed in a red mesh. Red roses Grand prix. The stem is 60-70cm. Choose the desired number of roses, and we will assemble them for you in a chic bouquet. Round bouquet of red gerberas, white daisies, yellow alstromeria surrounded by aspidistra leaves. The bouquet is decorated in stylish packing - a grid. Peach Rose Peach Avalanche with a stem height of 60-70cm. 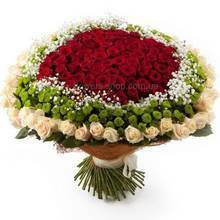 Florist will make a bouquet of the necessary number of roses. The bouquet is bandaged with ribbon. 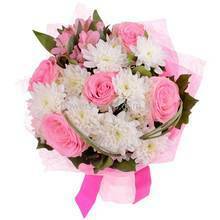 Cute white and pink bouquet. Pink alstroemeria and roses, white daisies and needle chrysanthemums are packed in a bright salad net and create a cheerful composition. 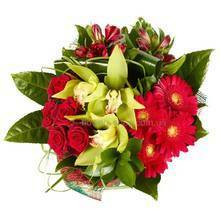 On the product page you can choose any number of flowers, which the florist will gather in a neat bouquet. Creamy Ukrainian roses of Talea variety. 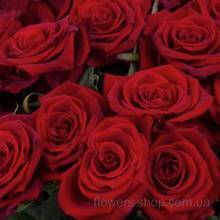 The length of roses is 60-70cm. Roses are collected in a spiral bouquet and bandaged with ribbon. You can order any number of roses. Bouquet of different color roses. In a bouquet, bandaged with a ribbon - Ukrainian roses of any sorts and colors. Customer wishes on the color of roses are accepted. A wonderful bouquet of alstroemerias in purple and white colors. The bouquet is packed in lilac paper, which supports the whole gamut of bouquet. A bush pink chrysanthemum of sort Katenka or a pink camomile. Decorated with delicate small flowers gypsophila and wrapped in floral paper. 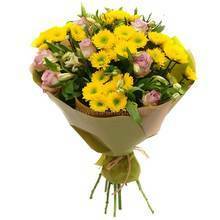 A dazzling bouquet of bright yellow shrub chrysanthemums with the addition of twigs gypsophila. 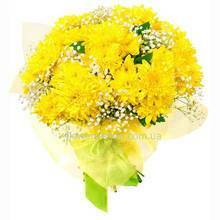 The bouquet is packed in yellow floral paper in the color of chrysanthemums. 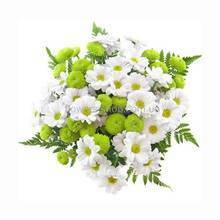 Funny bouquet with white daisies and unusual green chrysanthemums Filyn Green. The general color scheme is white-green, supported by leaves of ferns. Ukrainian orange roses of the Wau variety. 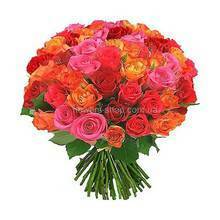 A bouquet is collected per piece from any number of roses. All roses are cleared of thorns, collected in a spiral bouquet and packed in fashionable paper "newspaper". 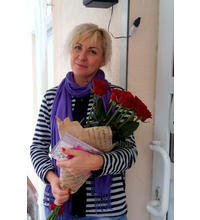 Do you want to buy and give a big bouquet of roses for a wedding, a birthday or a date? 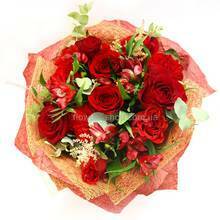 Choose a round bouquet of red roses surrounded by greenery, which will not go unnoticed. 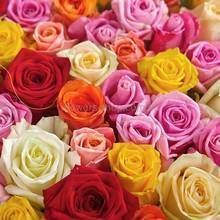 If you do not know what flowers like a girl, then we recommend to buy a classic bouquet of roses, bandaged with ribbon. 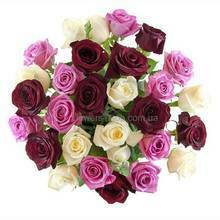 Different varieties of roses have a long stem and a large fragrant bud. 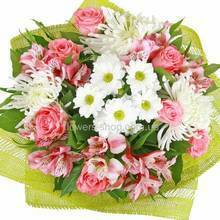 Bouquet in a delicate white and pink color scheme of pink roses and alstroemeria and white chrysanthemums. Complement the bouquet of velgrace twigs and a delicate pink wrap of fleece. 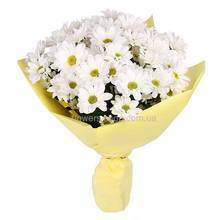 Classic round bouquet of white camomiles in delicate yellow floral packing. The size of the bouquet and the number of colors in the bouquet can be selected on the product page. 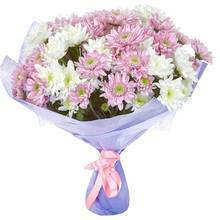 Monobuket of white and pink chrysanthemums of Baltika variety. A small bouquet is packed in lilac paper and is available for order in three variations. Pink picking bouquet of pink gerberas and pink roses Blush Akito with the addition of leaves ledwaren. A round spiral bead of fresh flowers is tied with ribbon in tone. Do you like alstroemeria? 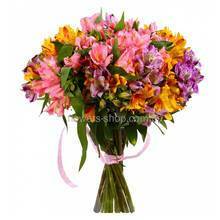 Then see what a cool bouquet of multicolored alstroemerias will be collected for you by florists. Fresh flowers are always an active gift! You need an inexpensive graceful bouquet? We present you a bouquet "Favorite" with pink roses Aqua, needle chrysanthemums, gentle alstromeria with fern and ornamental foliage. In our flower shop you can buy a bouquet for blondes and not only. 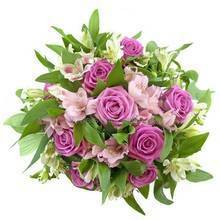 Pink color - the favorite color of blondes and this bouquet-shredding in the pink palette will like the blond beauty! 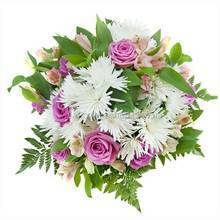 A stylish round European bouquet with roses and chrysanthemums in paper packaging and free delivery-surprise will be an excellent gift. Bouquet of fresh roses of fire color: red, scarlet, pink, yellow, orange and coral - a hot mix can be bought and delivered on the same day to anywhere in the city! A lovely round white-pink bouquet is created in the best traditions of European floristics: fresh single-headed and shrub roses with chrysanthemums are decorated with pink paper and a bow. A refined bouquet of delicate cream roses surrounded by refined lisianthus and air wrap. 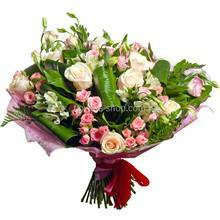 We will collect a bouquet of the freshest flowers and arrange delivery to anywhere in the city. 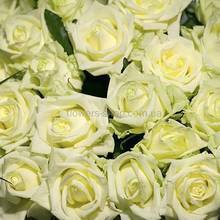 Beloved by many girls are white roses Avalanche in a bouquet with design. 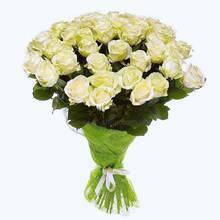 We can buy a bouquet of white roses in any quantity and present it with a surprise. A gorgeous bouquet of red roses Prestige, white hypsophila and decorative greens is created by our florists especially for special occasions and the closest people. 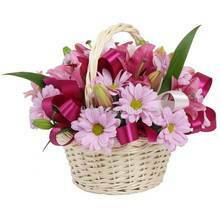 A nice little composition of pink daisies and decor in a basket will be a pleasant surprise. Buy chamomile in the basket can be in one click. 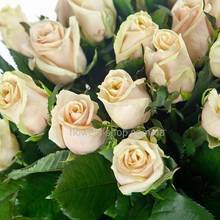 If you need flowers for a gift, then an amazing bouquet in pastel colors from bush and ordinary roses, eustom and greens is an ideal option for a magnificent holiday and for a date. 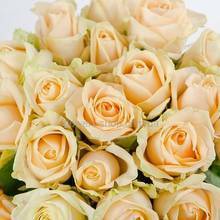 White eustoma and peach roses, intertwining and complementing each other, create a great congratulatory bouquet that can be bought with delivery directly into the hands of the recipient. Monobouquet of white and pink lisianthus, bandaged with ribbon. 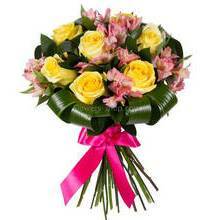 The bouquet is collected only from fresh eustom, the number of flowers in a bouquet at the request of the client. 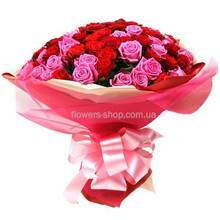 Here you can buy special bouquets for special people. This bouquet is a sip of spring freshness: bright tulips and irises in the greening of the green create an unusual tandem. Round spring prefabricated bouquet with daisies, irises and verdure greens. A bouquet from professional florists is packed in sisal. 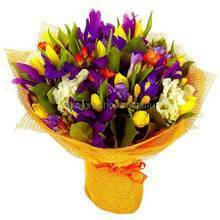 At any time of the year we recommend you to buy a enchanting bouquet of spring flowers: irises, tulips and freesias in bright solar packaging. 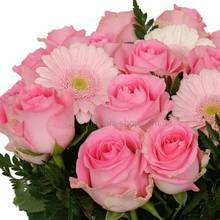 For your beloved - the best flowers! In our store you can buy a bouquet of white tulips, decorated in sisal while choosing any number of colors. We work for you around the clock! Yellow tulips are a symbol of friendship and hope, not in vain many girls like yellow tulips. 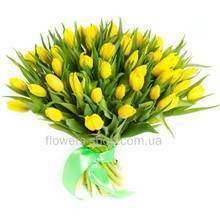 We can buy a bouquet of yellow tulips in any quantity. 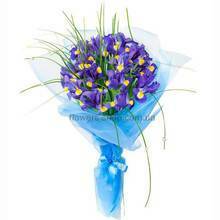 An exquisite bouquet of irises in air packing and decor with greenery. 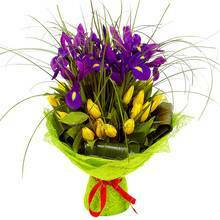 Buy a bouquet of irises you can not only a woman, but a man. A universal gift for any occasion. 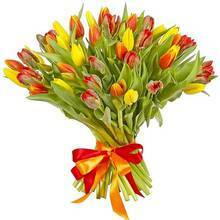 Inexpensive bouquet of tulips with delivery by courier is real! 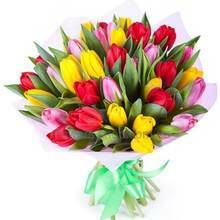 You can order multi-colored tulips in the package through the website or by phone. The number of colors in the bouquet can be selected. 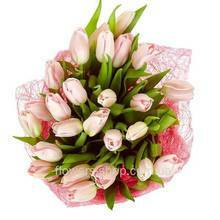 Here you can buy pink tulips one by one with delivery. 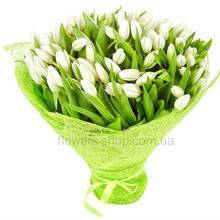 Flowers are decorated in a gentle air package, the number of tulips at the request of the client. Tulips pink, white, lilac decorated in floral paper in tone. Any number to choose from 15 pieces. 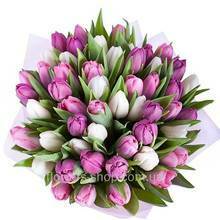 Tulips are a magnificent spring bouquet! A wonderful spring tulip mix of yellow, red and orange tulip flowers. The bouquet is bandaged with satin ribbon in tone buds. You can choose any number of tulips. 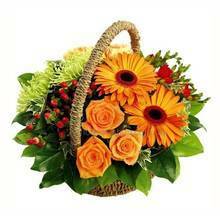 Flower basket in orange tones. The composition is collected from orange gerberas, orange roses, green odnolovyh chrysanthemums, red freesias and red berries hypericum. Colorful composition in flower pots of multi-colored gerberas, white and pink alstroemeria and twigs of white gypsophila. 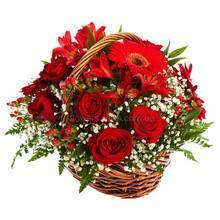 Flower arrangement in a basket in rich red color from burgundy roses of Grand prix, red gerberas, red alstromeries, red hypericum, white gypsophila and ornamental foliage. Large lush round bouquet. In the middle of the bouquet - red roses Prestige, then branches of white gypsophila, the next ball - green chrysanthemums and after there are cream roses Talea. A motley bouquet of fresh flowers. A round bouquet is made up of white lilies, white and red roses of the New Fashion, cream gerberas, burgundy Chrysanthemum Baccardi and white clove bush. The original collection of bouquet from pink roses Aqua, white chrysanthemums Zembla, burgundy orchids Tsimbidium, statics, greenery with a bouquet highlight - decor in the form of a bird sitting on flowers. A beautiful collection bouquet in lilac package consists of pink gerberas, white alstroemerias, white Zimbla chrysanthemums, red Cichbidium orchids and purple statues with greens. An unusual bouquet for the holiday and not only. A beautiful combination of exotic green orchids, red roses, red gerberas and alstroemerias, complemented by luscious greens and packaging. We can order a luxurious bouquet of red roses in a stylish elongated form, which is assembled in such a way as to emphasize the freshness of flowers and the richness of the composition. If you need to buy a special bouquet, then safely order this composition with scarlet roses and motley alstroemeria, which create a magic tandem, complementing and playing with each other! 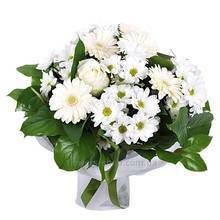 A delightful stylish bouquet in a white-green range of roses, chrysanthemums and ornamental foliage is created for bright girls. Buy this original flower arrangement right now. 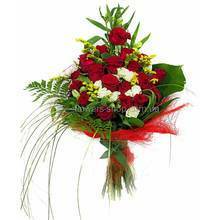 Exclusive bouquet in red from roses, alstromeries, carnations and greens, collected by professional florists. For those who want to emphasize the depth and passion of their feelings! If you are looking for a holiday composition, then a classic basket of red roses with greens and decor will be your best choice. 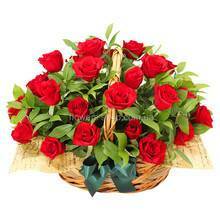 Red roses, placed in a basket, will complement the atmosphere of the holiday. 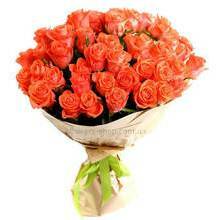 Right now you can order an inexpensive beautiful bouquet of roses and aust. All the flowers are fresh, peeled, made up in the right round bouquet and packed in sisal. 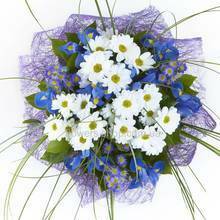 If you are looking for a white bouquet for a wedding or other event, then present this collection of bouquet in a white range of fresh roses, gerberas and chamomiles with greens in a snow-white package. 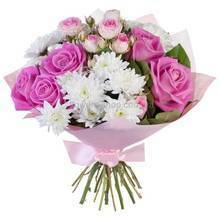 Pink bouquet is for girls who love pink color. Pink color goes to blondes, and brunettes. 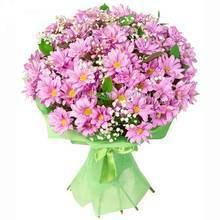 A pink bouquet with roses and chrysanthemums will mark the youth of the chosen one. 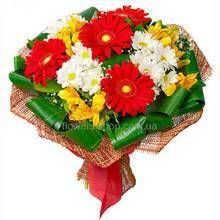 In order to give a bright bouquet you do not need a reason, especially when it's a bouquet with roses, eustomams and chrysanthemums. Such a spontaneous gift will be the best event of the day! 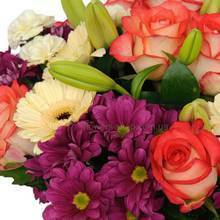 A beautiful touching bouquet in a gently pink palette with gerberas, roses and chamomiles. 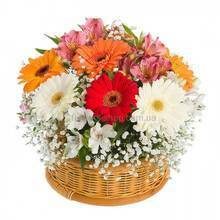 Buy an inexpensive composition of flowers can be on our site. 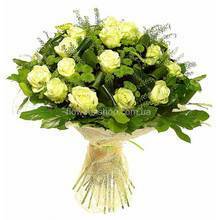 A bright bouquet of flowers from the red roses Grand Prix, green chrysanthemums Filin Green, white alstromeries, white freesias and fresh greens, decorated with a salad sisal. A magnificent bouquet of roses in a chic design. The combination of scarlet and pink roses is additionally emphasized by multilayer packaging, so that the beech looks expensive and rich. 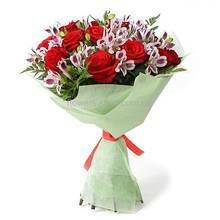 A graceful bouquet of fresh flowers is designed for the most sincere feelings. 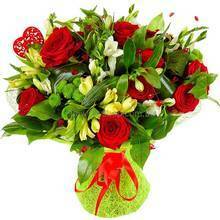 We can not only buy a bouquet of roses and alstroemerias, but also order it zhostavku anywhere in the city. 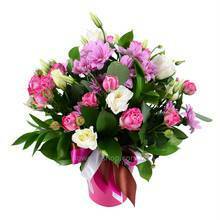 Order and delivery of flowers at the territory of Ukraine. 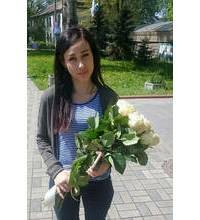 Buying flowers in Flowers-Shop.com.ua - it's easy and convenient! 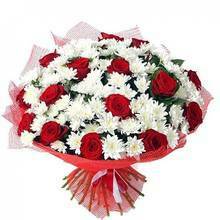 If you do not have an opportunity to congratulate a person you love face-to-face or you want to make a surprise, you could use our service of flowers delivery. In our flower shop there is always a wide range of bouquets and composition that can meet any taste. 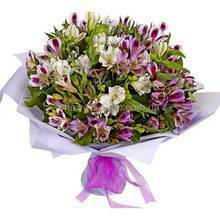 Your bouquet will be delivered just on time to any district of the city. 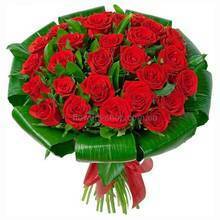 Flowers delivery solve the distance problem! 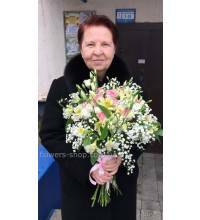 In order to purchase a bouquet just click a button "to buy in one click " and the manager will take the order over the phone, advice a convenient and fast method of payment, and the whole process won't take more than five minutes. Pleasant surprises to people you love, courtesies to business partners, congratulations of relatives - you can do that just by calling or by pushing a key on your keyboard. 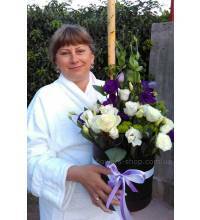 Perfectly made bouquet of fresh cut flowers from Flowers-Shop.com.ua - is a zest of the holiday. Giving flowers will always be in trend! 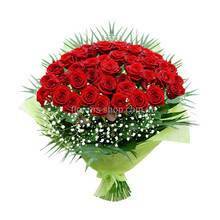 Moreover, now, it is even easier to buy flowers, because the high level of service, offered to the buyer, provides maximum comfort. We can deliver flowers not only to your house or office, but anywhere according to request of the customer or the recipient. 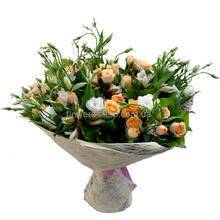 Convernient web-site with a huge range of flowers. Any offline shop can not provide such a range like we do. All products have a detailed calculation and description, some pictures, such information as pricing, and the nearest date of order execution (not all flowers are available on the same day, some are available on the following day or in 1-2 days). 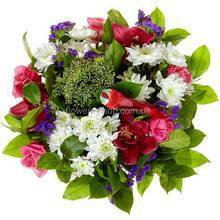 Professionally designed composition of fresh flowers. 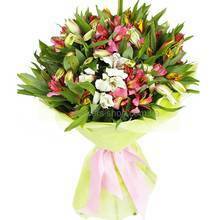 All bouquets are made only from floristic quality materials and decorative greenery. 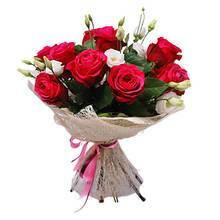 Even if they are just roses, bought by the piece, all the extra leaves and thorns will be removed, the bouquet is carefully assembled bud to bud and tied with a ribbon. In order to make the recipient even more happy, in addition to flowers, you can order a vase, fruit, candies, toys and cake. 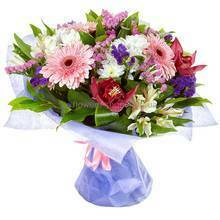 Pickup or delivery, presenting flowers face-to-face or entrust us to do that - you are the only one who decide! Our couriers can behave differently. 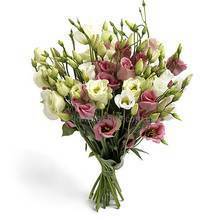 They can be both pretty and polite, providing a holiday atmosphere and completely neutral - just pass a bouquet. Everything depends on the situation and your wishes. Orders can be arranged through the manager by the phone or online through the basket. Shop is organized so that you can make a purchase both in one click and call back, and without the participation of manager-consultant. There is no commissions if making online payment by VISA and MasterCard - , only the cost of the order. Discounts on flowers in any city. Self-registration of the first order and indication of e-mail makes you to become a member of the loyalty program. Provided discounts are applied to all of your orders and to all the cities where we provide services. We do not send annoying ads and do not bother you by calling, our service is completely unobtrusive. We appear in your life only when you need us. Add us to your bookmarks! Ordered flowers can be paid by any convenient way. 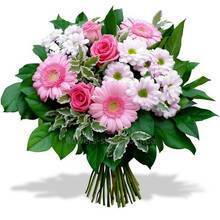 The delivery of flowers in Ukraine is available to any location, even if you do not find it in this list. Maybe you think that if you buy the most expensive bouquet, and we will keep it, let us assure you - it won't enrich us! In no way we would jeopardize our reputation and sacrifice years of work for the sake of immediate profits! We are not going to cheat! We have created a really high-quality online resource, spent a lot of time and efforts. Such web-sites like ours are not made to deceive, they are made for people. Its administrative panel connects florists all over 125 cities. In 2004, we worked in 5 cities, now in 2015, and we provide our services to more than 100 cities. We hope that this pair of lines will dispel your doubts, and the recepient will be very pleased with presented bouquet, and you will be impressed by the quality of our services. Very nice, quick, friendly and reliable service. Highly recommended. They did a great job with the flowers that I ordered for a funeral. Thank you! ZAKAZAL CVETI S DOSTAVKOY !!! OSTALOS OCHEN DOVOLNOY !!! They were very beautiful. I saw a picture. Her reaction was… “I can’t get enough looking at the bouquet. It is one of the best of my life!" Thank you for your excellent service!